Will Contestants Survive the Challenges of the Newest AXN Reality Show "Kicking and Screaming?" The most unlikely couples find their hands full in taking in more than they can handle in the new reality series Kicking & Screaming, which premieres this August on AXN. Ten survival experts are paired with hapless amateurs who have no experience in living outdoors as they fight their way through a series of challenges in a remote jungle of a South Pacific island where they must overcome dangerous animals, raging rivers, hunger, and extreme weather. While the experts are used to surviving in the wilderness, their privileged partners are not, resulting in lots of arguing, bickering, and swearing. With a cash prize of $500,000 at stake, the mismatched teammates realize that in order to win, they must work together to thrive in the wilderness and to survive the toughest challenge of their lives. The show, from Fear Factor executive producer Matt Kunitz, is hosted by New Girl actress Hannah Simone. 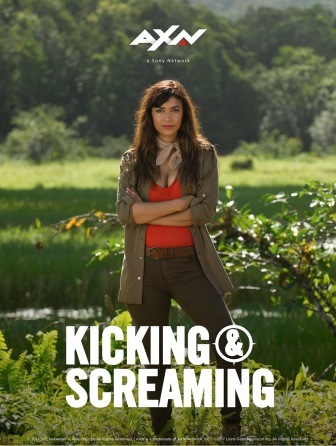 Kicking & Screaming premieres on August 7 and airs every Monday at 9:45pm first & exclusive on AXN.